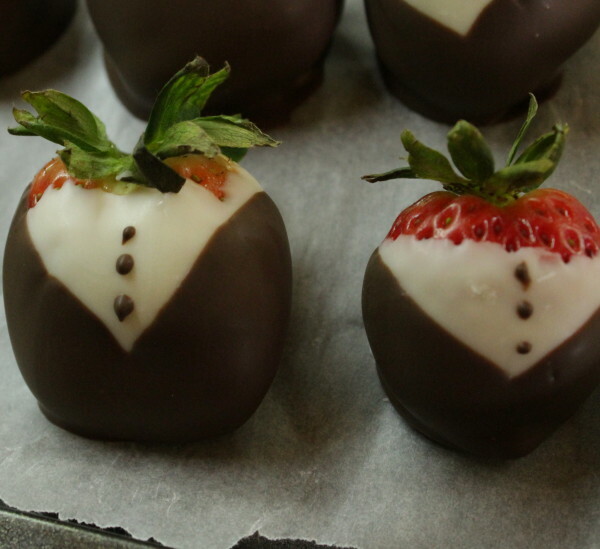 These chocolate covered strawberries give the look of class with much less effort than you would expect. 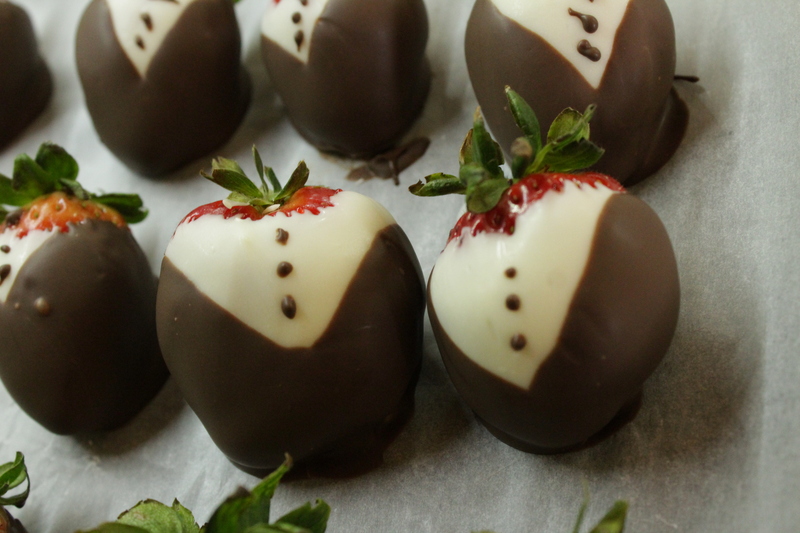 The tuxedo effect is given by multiple chocolate layers on the strawberry. I have never been a strawberry fan until very recently. I remember a time when I was younger that I was served a big plate of chocolate covered strawberries and I spent most of my time eating the chocolate outside and trying very hard to not accidently get any strawberry juice in my mouth. Now though I can not get enough of them and I have no idea why I hated the idea of them before. 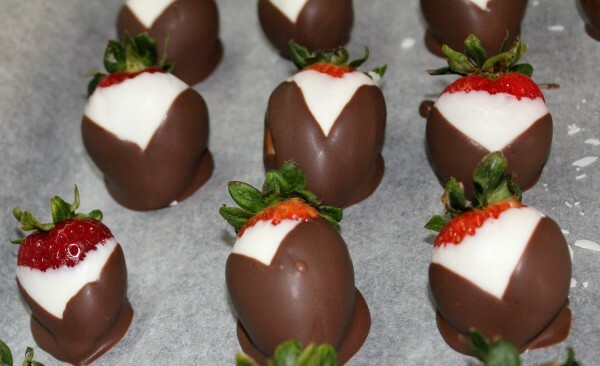 I made these beautiful tuxedo strawberries for Valentine’s day this year as part of our dessert. We both enjoy regular chocolate covered strawberries but hubby has always been a fan of the fancy version so I thought I would give it a try. At first, it seemed a bit difficult but once I got the hang of it, it was easy and went fast. 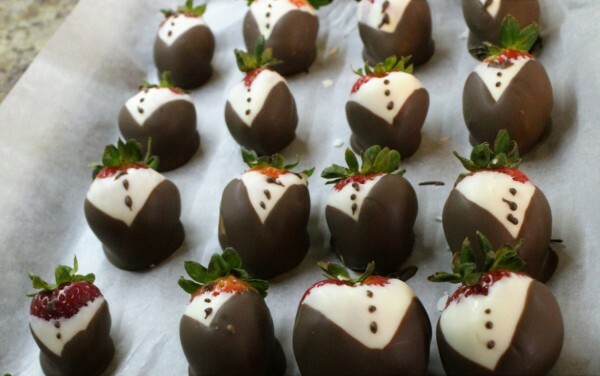 First you will need to dip into the white chocolate to form the “shirt” part of the tuxedo. Try to keep this layer thin so that you don’t break your teeth when biting into them later. Once that has set up start melting the chocolate for the “coat” part of the tuxedo. Now this is the tricky part you want to make a V showing the white and covering the rest. I wish I had thought to get a video, next time I will and add it in. 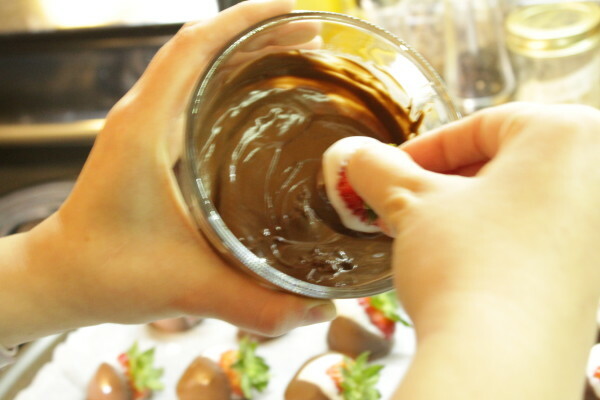 Use a smaller dish so that the chocolate will be deeper. Hold the dish in your hand while you dip. This will help you get the right angle. Come in at an angle from one side then go down on the other side to form the V.
I hope that this and the pictures help it to make sense for you. Once you get a couple done you will know the best way to hold the strawberry. 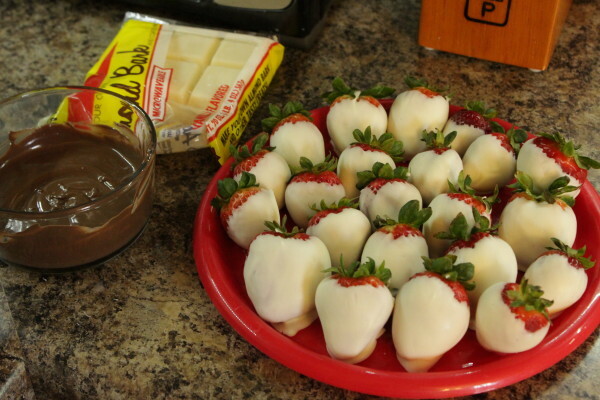 Once you have the strawberries dipped just take a toothpick and make little dots down the “shirt”. 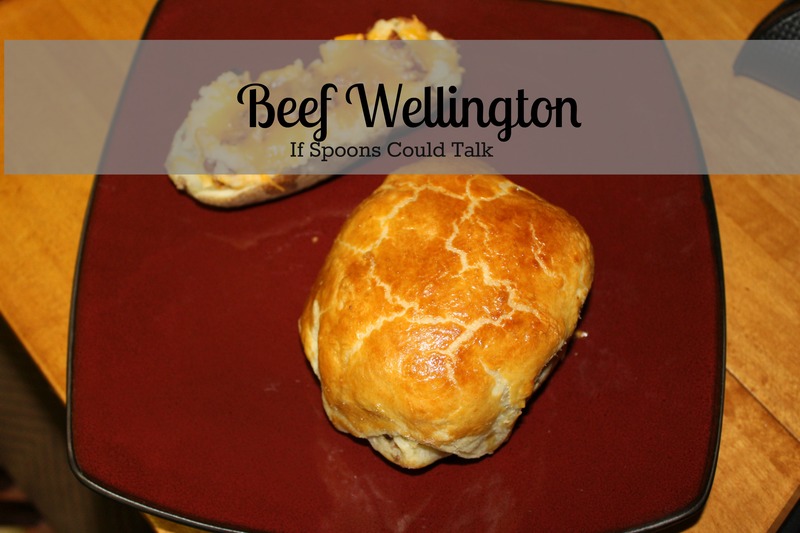 Delicious easy dessert that looks classy. Wash and dry strawberries very well. 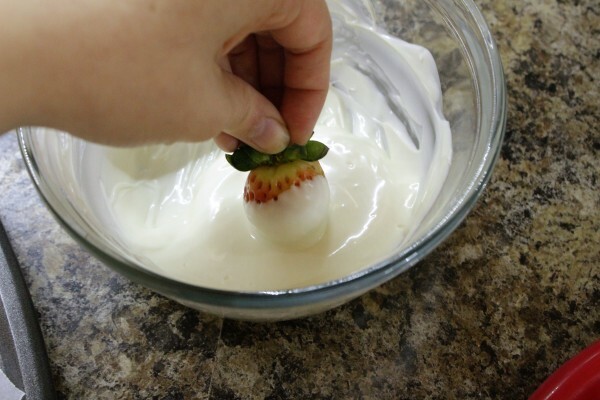 Dip each strawberry into the white chocolate so that it is covered except for a little beneath the leaves. Let the chocolate harden. Give at least 10 minutes. While they are hardening melt the other chocolate. Dip the strawberries at an angle on both sides to form a V in the middle. Dip a toothpick end into the leftover chocolate. 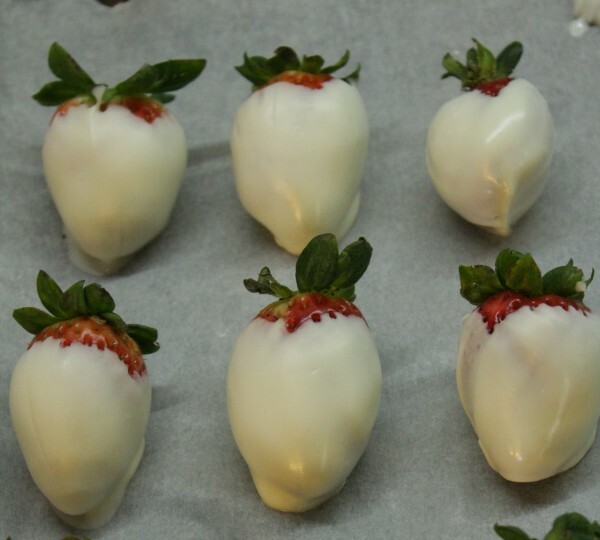 And add 3 little dots to the white of each strawberry. Let harden until set. About 10-15 minutes depending on the chocolate you use. 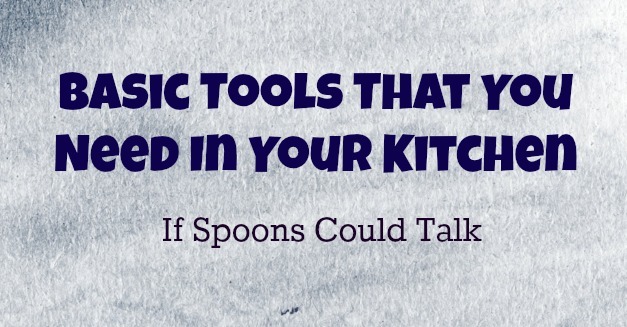 Store in the refrigerator until about 10 minutes before you want to eat them. Let them sit out so the chocolate coating is not as hard to bite.